Francke Foundation Buildings is part of the Tentative list of Germany in order to qualify for inclusion in the World Heritage List. My brother studied in Halle and I went to visit him repeatedly. During all those visits I never went to or noticed the Francke Foundation Buildings. Halle itself is not that touristy, and this site specifically even less so. What I enjoyed about it was that it's not a museum. The schools founded by Francke are still in operation, 300 years after the fact. Quite a feat for a foundation. Due to this being an active school, several parts are not open to public. There is, though, still enough to see. The library is interesting. As is the tiny museum showing items from all over the world in order to support the studies of the students according to Francke's ideas. My gut feeling is that it hinges on this being one of the earliest privately founded schools in the world. Also, the school is still in operation and Francke's ideas influenced how Prussia set up its schools. From an architecture point of view it's certainly not a WHS. Update: Germany decided to retract the nomination upon the very negative ICOMOS evaluation they got. Pretty simple if you happen to be in central Germany. It's a 15min walk from Halle Main Station. Several WHS (Wittenberg, Wartburg, Wörlitz) are close by as is a tentative site (Naumburg). Personally, I enjoy Halle old town. The area around the Saale is quite nice, too. And Halle forms one metropolitan area with Leipzig, also very nice. Halle's outskirts, though, are really ugly, most notably Halle Neustadt. The Francke Foundations are on the German tentative list since 1999 and a candidate for inscription in 2016. In 1698, the theologian August Hermann Francke founded a school for poor children and an orphanage according to the ideals of Pietism. In the 18th and 19th centuries, the foundation grew continuously, today it is an area with several dozen buildings and is home to schools, university institutes and other social and educational institutions. In the GDR, the historic buildings were only poorly maintained, but in the past two decades extensive renovations have been carried out. The proposed core zone includes the oldest buildings from the first half of the 18th century. The historic orphanage and the adjacent buildings form an elongated U-shaped complex. 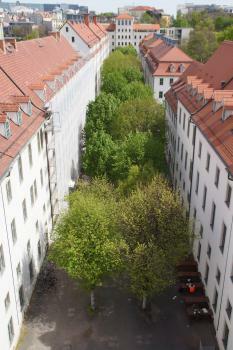 The photo shows the view from the roof of the orphanage to the 200 metre long alley of lime trees in the courtyard. At our visit in April 2014, the restoration work was almost finished and everything looked new and fresh, the facades in bright white colour. We did not have the impression to view historic buildings, although some of them are half-timbered houses. After a stroll around the grounds, we bought a ticket to the museums (6 Euro) at the visitor information in the former home of Francke (building No. 28). What's there to visit? Not much, to be honest. First, two small exhibitions on the ground floor of the historic orphanage (No. 1): on the history of the Francke Foundations and on the ideals and influences of Pietism. Second, also in the orphanage, the highlight of our visit: The Chamber of Curiosities ("Kunst- und Naturalienkammer"), a strange collection of about 3000 objects: jars with prepared animals, minerals, Greek and Egyptian coins, death masks, mollusc shells, two seeds of the coc-de-mer, but also everyday objects such as clothes, shoes, documents and much more. The small items are kept in historical cabinets. But there are also large objects: a stuffed crocodile from the Nile, globes, ship models, and the largest, a Armillary sphere made of wood and wire. Such collections of curiosities were popular in Renaissance and Baroque, they represented the knowledge of the period. In Halle, the collection was mainly used for educational purposes. We had really fun with that quirky mixture of things, that were once considered important, valuable and curious. And finally, the historic library (No. 22) that has been restored according to the original plans from the 18th century. But visitors should not expect stucco decorations and paintings like in the libraries in Weimar, Vienna and Melk. It was a Protestant institution, all buildings and rooms are sober and austere without lush decoration. It is not possible to walk around in the library, you can only view the interior architecture from the entrance. The bookshelves are arranged like the stage-setting in a Baroque theatre ("Kulissenbibliothek"). On the website of the Francke Foundation is stated that it is "a unique example of bourgeois functional architecture for social and educational purposes" and that the "architecture represents a reform concept with global impact". It has to be appreciated that the historic buildings have been preserved in an exemplary manner and that they are still used for the original purposes. The Francke Foundation might fill a gap as a site representing (non-university) education, but in my opinion it would be a rather weak WHS, the architecture is not outstanding. If you visit Halle, you should not miss the State Museum of Prehistory. They show the Nebra Sky Disk registered in the Memory of the World program.